Looking for a summary on how Practice Ignition Payments can help your business? Look no further. Collect billing details from your clients when they accept your proposal and automatically process payments through the Practice Ignition payment gateway. A Hands-off Accounts Receivable Process. Check out the video to learn exactly how they do. Collecting your client's billing details upfront even if you bill on completion gives you the power to collect payment from your clients when you invoice them, rather than letting them have the power to pay you when they feel like it. This can eliminate debtors from your practice and remove friction points from your client relationship. Taking this one step further, the "Require Payments" is easily the most popular feature amongst Practice Ignition users. New prospects to your business cannot accept your proposal until they provide a payment method. This guarantees you get paid on your terms, for all the work you do. What Makes Practice Ignition Payments Different To Other Processors? 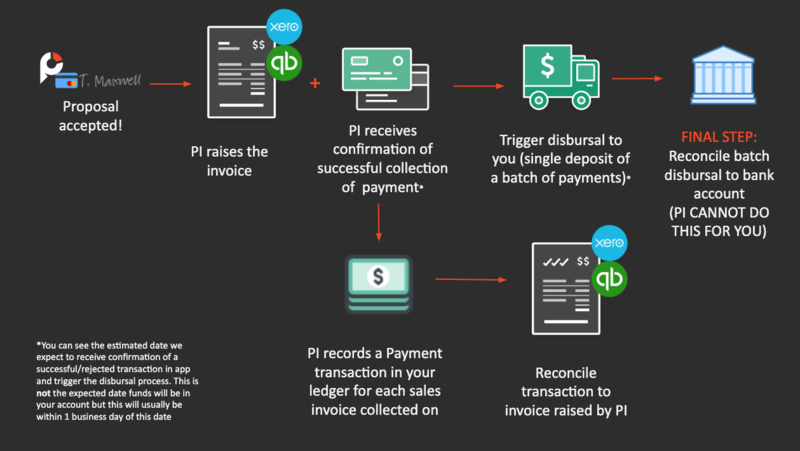 If you are interested in using Practice Ignition for proposals but wanted to see how PI compares against other payment processors who offer one-time and recurring payments, this video will highlight some of the key advantages to PI Payments. With Practice Ignition fully integrated, you can completely automate your Accounts Receivable process. 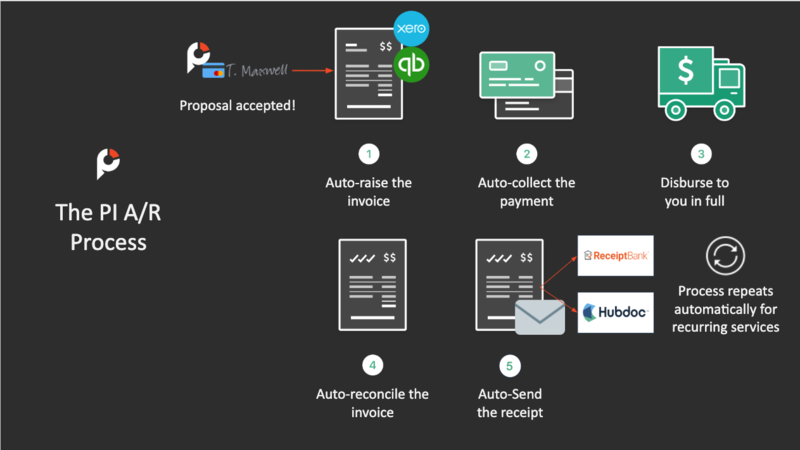 When a proposal is accepted, your invoice/s will automatically appear in Xero or QBO. Once payment is collected we disburse the funds to you, reconcile your invoice, and automatically send the receipt to your clients. You can also opt to add additional invoice notification recipients (such as a Receipt Bank or Hubdoc email address). Even better, if you have recurring services, this whole process will repeat every single week or month! 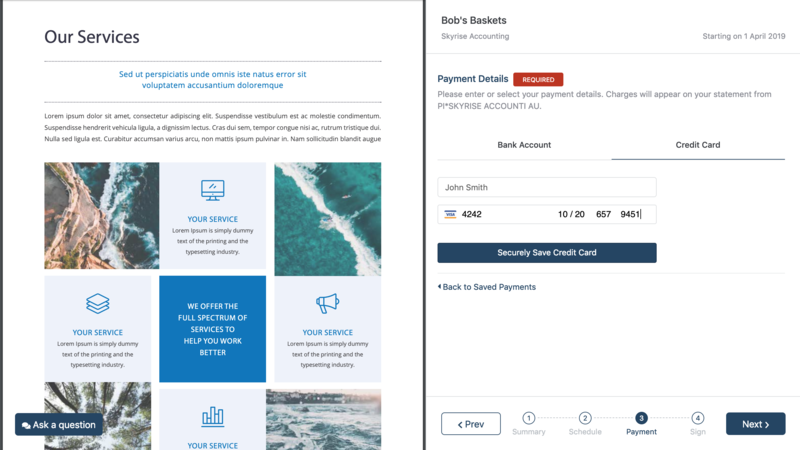 If you have Xero or QuickBooks Online integrated with your Practice Ignition account, it will automatically reconcile the payments against your client invoices within 24 hours after the funds are received in your account. Practice Ignition deposits 100% of the invoice total (including applicable sales tax if you have taxes enabled), instead of net-of-fees. This guarantees that your client invoices can be automatically reconciled correctly. Practice Ignition collects the transaction fees in arrears from the credit card you used to subscribe to your account. If you are using Xero, we create a clearing account (PIPayments) in your Xero file where Practice Ignition will automatically create a transaction for each payment that has come in, which is then reconciled against the client invoice. If you are using QuickBooks, we use your Undeposited Funds account to create transactions for each payment which has come in, which we link automatically to the invoice to reconcile it. 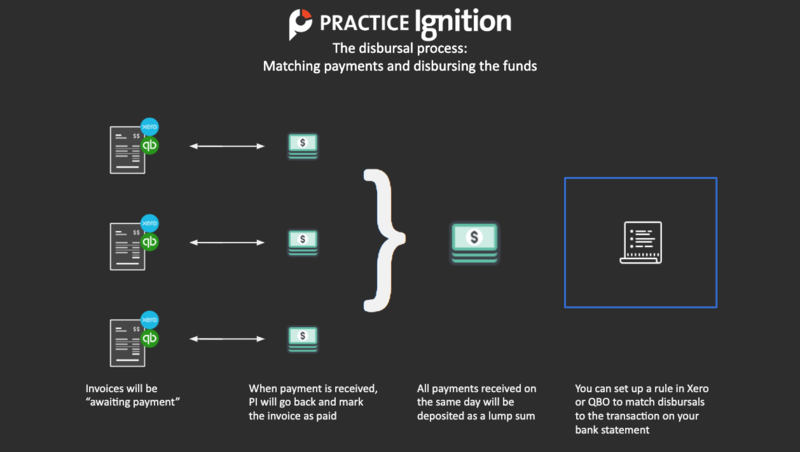 Practice Ignition will deposit lump sum disbursements (made up of all transactions that were deposited on the same day). This is to keep the number of transactions you need to reconcile against your bank statement to a minimum. Disbursements are done daily as funds are successfully collected. If you are using Xero, to reconcile your bank feed against your lump sum disbursements from PI, you will need to set up a bank rule to automatically apply any payments from Practice Ignition to the clearing account. Learn more about reconciling payments in Xero here. If you are using QuickBooks, you reconcile your bank feed against your lump sum disbursements from PI, you will need to apply the lump sum amounts that come into your bank account, to the Undeposited Funds account. If you have a trial account, select the appropriate plan for you and once your account has been activated, you will have access to the Payment Settings where you can enable the feature and set your preferences. To use payments, you must have a valid bank account which holds funds in the local currency* and said account must be with a local bank within your country. You must also be able to provide documents that confirm the status of your business as well as identification from a company representative. For more information on payment collection fees, please see our pricing here. Professional and Scale plans provide discounted payment rates for all transactions. Please note: Practice Ignition only charges fees on successful transactions only. There are no chargebacks/NSF fees. All of our payment providers have been audited by a PCI-certified auditor, and are certified to PCI service provider level 1. This is the most stringent level of certification available. Click here for more information on security. Note: For information on how to use payments in your proposals see our article here. * With the exception of $USD bank accounts held with Canadian Banks, for users in Canada. However, all payments collected via an account connected to a $USD Account, all collections will be based on the currency you set in your account. Practice Ignition does not support multi-currency.